For Alex Horne, the opportunity to help design and build a BattleBot was a dream come true and an experience that he will never forget. Horne was enlisted to be a member of Team Hammertime by Jerry Clarkin, a Malvern resident who has been something of a mentor to him. Technically, what Horne and Team Hammertime built was a 250-pound flipper-style combat robot named SubZero. 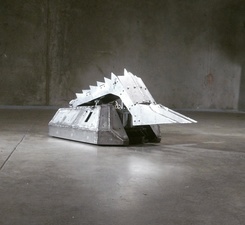 The ABC television show that the combat robots compete on is “BattleBots.” The series aired over the summer, and even though Team Hammertime didn’t advance beyond the preliminary rounds, it was a tremendous learning experience. Horne, 21, is a senior at the Pennsylvania College of Technology. When he was growing up, he was the kid who was always taking things apart—and then putting them back together again. He has a natural affinity for building things. Horne was a ninth-grader at Upland Country Day School when he attempted to build his first combat robot. Initially, his parents didn’t like the idea. Combat robots are built to be destroyed, and it’s certainly a challenging and ambitious undertaking for a ninth-grader to build a functioning combat robot. But Horne found a way to circumvent their disapproval—he decided to build a combat robot as his independent project at school. As part of the project, he conducted research on building robots and went to exhibits and competitions so that he could meet with others involved with designing and building robots. His first attempt at building a combat robot was “Shish-Kabot,” a 30-pound robot with a lifting spike. Working on this independent project was in addition to the regular curriculum that all Upland ninth-graders are expected to complete. “Then, I was hooked,” he explained. Combat robots are constructed by people who know that they can be destroyed in a matter of moments. During the combat robot competitions, he met Clarkin, who was one of the more experienced and accomplished builders in the area. Horne took Shish-Kabot to Motorama, the largest robot conflict tournament in the area, and he finished in second place. He also won numerous science fair awards, including the Chester County Science Fair High School Engineering Award and a second place finish in Overall Engineering at the Tri-State Delaware Valley Science Fair. He was also invited to display his robot and speak at the University of Pennsylvania’s NANO/BIO Day. After Upland, Horne went to high school at the Westtown School, where he helped launch the First State Robotics Program at the school. He continued to spend a portion of his free time working on robots. He advanced to the point where he can build a three-pound robot in an afternoon—and do it for less than $100. For a time, Horne worked with Clarkin on building robots as a part-time business. But when Horne enrolled at the Pennsylvania College of Technology to study engineering, he became very busy with his coursework. For awhile, he and Clarkin didn’t work together on any projects. Then, last year, an email from Clarkin showed up out of the blue inviting Horne to help out with constructing SubZero. Horne said that he really appreciates that Clarkin invited him to join in the effort. While Horne enjoyed the BattleBots competition immensely, he is now focused on finishing up his coursework to earn a degree in engineering. “It’s a broad, interesting field,” Horne explained. He has constructed at least 15 combat robots through the years. He’s a regular at combat robot events, and often works with other builders. In fact, he knew many of the people who took part in the BattleBots competition because he had met them at various events. Combat robots have garnered a lot of attention, thanks in part to television shows like “BattleBots.” He said that the popularity of combat robots could see even more engineers, high-tech builders, and college students getting involved in the smaller, regional events. The members of Team Hammertime spent months working on SubZero, only to see it destroyed in a matter of moments. Horne said that’s just a part of combat sports, and the builders must accept that.